So let’s kick off this 85-year event with a little tip sheet on how you can help your own little kiddo(s) with their speech concerns, namely CAS (childhood apraxia of speech). What you need: Adult and child. What you do: The adult calls out different kinds of movements: “Touch the sky way up high—touch your toes way down low—wiggle your hips—rub your tummy.” Child plays along and can repeat words as she feels ready. Add in other body parts like nose, ears, hair, mouth, tongue, knees, etc. Speech payoff: Whole body movements can help get your little pumpkin talking; they also encourage listening to directions and enhance receptive language and identification of body parts. What you need: Nothing but you and a child with CAS. What you do: Think of all of the animals you can impersonate. Can you make a great pig noise? Do it—but really act like a pig by rolling around (as if in the mud). After you are done oinking, say the name of the animal. Bark like a dog, jump like one, pant and lick like one. Meow like a cat, rub your head on a loved one, purr, and curl up like a cat. Variation: As your child gets better at this, she has to identify the animal by name (“Dog”) before moving on to the next one. Speech pay-off: Besides the fun and giggles you’re sure to get, it helps your child learn about different animals and the sounds they make. Plus, making animals sounds may be less intimidating than saying actual words. In fact, the Kaufman Speech Praxis Treatment Kit: Basic level begins with the animal sounds. These are often some of the first words children say. What you need: Kid(s) and a ball. What you do: Sit on the floor, with legs apart and take turns rolling the ball back and forth (or tossing the ball in the air as your child’s skills improve). Practice saying target words or telling about a favorite something (food, color, season, friend, etc.) while you roll/toss the ball. Do this until you (or she) tires of it, but aim for at least six passes. If your child is nonverbal, you roll the ball and say, “Mommy’s turn.” When it is your child’s turn, say, “Kate’s turn” for her. Speech payoff: This is a wonderful way to encourage conversational turn-taking: speaker + listener = conversation. Teach this concept early. What you need: Yourself and a fun/interesting place to walk. What you do: Walk around your park, neighborhood, or local arboretum with your family. Using the letters of the alphabet as a guide, find items along your path that begin with the letter, sound, or word your little child is working on in therapy. First choose words and sounds your child already knows and build upon that base. Variation: Label every tree (or other item) you see as you pass by (a form of concentrated practice; auditory bombardment). Speech payoff: Repetition, whole-body learning, develops a love of nature, plus it’s a fun way to sneak in those speech drills. What you do: Design the course and then have your child complete the activities. You can make it more challenging by having your child say key words/phrases/sounds at each station. Encourage verbalization at the end, such as, “I’m a winner,” “Hooray,” or another similar phrase. Afterwards, you can pull out the speech flashcards. You may be amazed at how much faster and easier they are once the body (and brain) have been “warmed up” with a vestibular/movement activity. Speech payoff: Fun, silly play beats boredom any day, and it just might be what your rough-and-tumble kid needs to stimulate the verbal part of her brain. What you need: Flashcards (they don’t have to be the fancy speech kind—make your own or buy some), speech exercises/worksheets from your therapist, objects from around the house that correspond to sounds/words/phrases you are currently targeting, even coloring books will do! You’ll need access to music and your kid(s). What you do: Arrange the items you gathered on the floor. Then start the music and the dancing. When the music stops, have your child pick an item from the floor to talk about, or practice. Do several rounds. Speech payoff: Again, it’s work disguised as fun involving movement, rhythm, and vestibular activation. 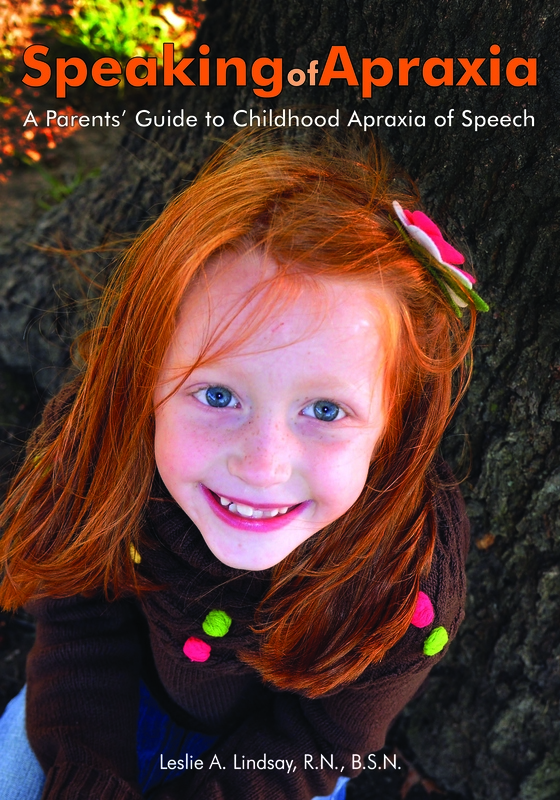 You’ll find these and other ideas in “Speaking of Apraxia: A Parent’s Guide to Childhood Apraxia of Speech” (Woodbine House, 2012). If you would like a signed copy of the book, please contact me privately at leslie_lindsay@hotmail.com and I would be happy to give you more details.